Marie joined us in November 2015 as a receptionist. She had previously worked at a human dental practice. She also spent 8 years working in the family business, collecting an SVQ in retail before moving onto Charles River Laboratories in research before joining DentalVets. 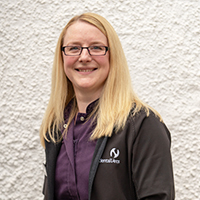 Marie was born in Dumfries, subsequently moving to Orkney and, finally, to East Lothian where she now lives with her fiance and cat. She enjoys walks, travelling and photography.